The onset of knee pain after 60 minutes of cycling that is curtailing his enjoyment of being on a bicycle. Additionally the rider has a lower back and neck condition – so in principle more than one significant condition to contend with. The rider has a general list of issues relating to general comfort on the bike. He has been advised to take pain killers, his position has been modified by several bike fitters already who have also offered him an array of exercises to combat his ailment and advice around posture on the bike. He has been sold various inserts and wedges for his shoes and has taken a scan on his knee to check for damage. Martin C. works in the city, mid 40s, has commuted to work for 12 years and has taken up sportive riding in the last year. His commute on a flat bar bike is without issue however as soon as he moved to his sportive, race bike his issues surface. The start point is to strip back some of the changes that have been made so we can review Martin as an ‘individual’ i.e. remove wedges from shoes, watch him ride his current set up and conduct our own limb measures and postural mobility review. His starting position is too upright and conservative. There is insufficient room in the top tube, stem and drop (the cockpit) for adequate lengthening of his back which forces an unnatural locking of arms and stiff, upright back position. He was advised by his previous fitting that this would offer a more comfortable position which is a classic misconception for bike riders with lower back issues. His postural assessment revealed he had sufficient mobility to take a more aggressive position. The analysis revealed that he was forced to ride in a relatively cramped position with his knees taking the brunt of the effort rather than pedalling with a smooth action from the glutes and thighs. 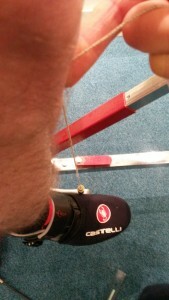 His knee position relative to pedal using the plumb line test confirmed the misalignment. His original fitter / bike shop had advised a frame a little too small for him. A longer stem and lay back saddle will help offer the extension that he requires through the cockpit to suit his limb measures. Additionally, the recommendations for the exercises could be significantly trimmed down and targeted to cope with the presenting issues. So rather than spending 45 minutes every morning before riding running through his stretching program this could be shortened to 10 minutes of effective pre-mobilisation exercises. Martin now has a much better understanding of where his issues are coming from and why. The months of searching for answers has finally paid off and we anticipate trouble free cycling for Martin. In this case, using the plumb line measure to assess knee / pedal alignment was relevant and useful. We don’t have a set formula for the fitting assessment rather take a holistic approach which enables us to offer an independent review. We can combine bike size, bike geometry, bike set up and postural mobility to find the suitable position.